Genetically thornless, semi-erect canes are vigorous, spine free and easy to manage. This blackberry's black, glossy fruit resembles what you would find in the wild—perched on dark green foliage with small white flowers. Loch Ness' rich, sweet-tart flavor will have you dreaming up all kinds of recipes—blackberry pie, jams, jellies and more! Plant in full sun to partial shade in soil that's well drained and has a pH of 5.5-6.8. 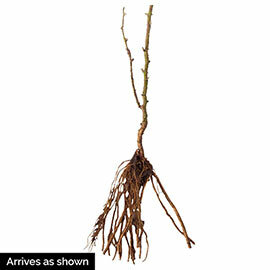 Its compact growth habit only requires 3' of space between plants and can be trellised or grown with a wire support. Resistant to double blooms. Ripens mid to late June. No. 1, 2-yr. plants. Zones 5-9. Spacing: 4 feet, rows 1 foot apart. Form: Habit: Semi-erect, genetically thornless. Soil Requirements: Well-drained, rich, sandy loam 5.5- 6.8 pH. Growth Rate: Vigorous once established; canes arching, to 3 m length. Pruning: Plants flower on one-year-old wood, so the new canes need to be separated from fruiting ones. After cropping, cut the fruiting canes down to the ground and tie in the new ones that have grown that year. 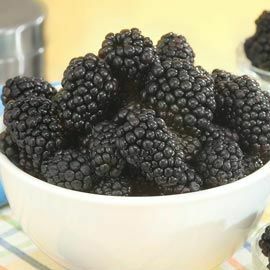 Fruit: Black, glossy, resembling wild blackberry. Rich, sweet-tart flavor.